You probably witnessed sabering plenty of times and it seems like there is a magic trick behind it. Somehow, you may think that only a professional master saber “sommeliers” can do so. However, anyone can pull off the lip of the bottle together with the cork and perform such an art. All you need is to understand the principle behind it and quite frankly, the real trick is what happens inside the bottle. Performing sabrage requires two things, one you need a champagne (of course) or bubbly wine when you practice, secondly, you need a champagne saber. Yes, it requires the right tool in order to perform this art perfectly. You may encounter some blogs or articles that may suggest using a regular kitchen knife. However, keep in mind that a kitchen knife is intended for cutting meat. It does make sense to use champagne saber since it is intended to pull off the lip. Moreover, using a champagne saber or champagne sword is safe and there is no risk getting yourself injured. The rule of thumb - always use champagne saber or sword when regardless whether you are practicing or performing. Champagne saber is designed for performing sabrage. Even though how intimidating the saber is, it is the safest tool. Why so, it is because sabrage does not require sharp edges. In fact, when you look closer, you’ll see that the blade is blunt for its purpose. The bottle should be chilled, but keep in mind not to over chill it. As mentioned the trick here is not the swing and there is no such thing as a proper stance when doing so. Chilled champagne is what you need to have enough pressure from inside. Get things ready by wiping the bottle with a table napkin. This ensures preventing the bottle from slipping. You don’t want to waste such good wine, do you? Hence, never overlooked or disregard this step when getting things ready. Next to consider is the place where you are going to perform sabrage. For practice, it is preferable to use your backyard where no one would be hit. When performing, make sure to point the bottle safe where there will be no potential accidents. Now, going back to the bottle, you need to remove the foil and the wire support.In some cases, the cork pops up which makes such epic fail. Therefore, when doing so, it is highly recommended to put your thumb on the cork as you remove the wire. Then it is time to locate the seam of the bottle up to the lip. The bottle seam is the weakest part of the bottle and this is where you are going to follow this line as you slide the blade from the neck to the lip. It does not require you to execute much force when sliding the blade. In fact, too much force may get yourself injured and the champagne saber has the possibility to bounce off. Perfecting the art may take some time and it requires practice. Champagne is indeed the highlight of celebration and an occasion would never be the same without it. Often you see uncorking the bottle of champagne by either using a corkscrew or pulling the cork a bit and with a little shake as you see millions of bubbles flows out. There is another way to do so and it is unique. By using a champagne sword or a champagne saber can be very exciting. Though it is a unique way of uncorking the bottle, it has existed for a long time. In fact, it started from the war back in the time of the great Napoleon Bonaparte. Sabers and swords are the primary weapons of those days. It is a deadly melee attack and these swordsmen are willing to kill and to be killed. The hussars Napoleon’s great horsemen are fully equipped with these curved swords which are specially designed for the men mounted with horses. During the battle, there would be victories and defeat. One way to celebrate triumph is by having a drink of such good wine. These men need to improvise on how they would perfectly uncork the bottle of champagne without using the cork. This is where the art of sabrage or sabering was born. They would simply slide their weapon as the lip together with the cork flies. The art had been performed ever since Napoleon together with his great soldiers of battle visited the European part. Unlike those days, sabers were meant for stabbing and slashing, champagne sabers or swords are now manufactured by many for searing. As you look closer to the blade, you can see that it is blunt where you can’t see any kind of sharp edges or whatsoever. The reason behind sabring is what really happening inside the bottle. Though it may look simple, it may require you some practice to execute it perfectly. Oh, by the way, keep in mind that it is recommended to only use the champagne sword or champagne saber when practicing or performing this art. Your ordinary kitchen knife would not work and may injure you. Sabering is unique because of the fact that it is part of the world history. In addition, most consider this as an art rather than performance. Whenever you see a champagne sword or someone who does the sabering, you know the fact that there is a story behind it. Precision with the right stance and the right amount of force will be needed to perfect this art. This is why sabering is unique and whenever it is perfected, the audiences will certainly be standing in awe of amazement. You can find champagne saber/s via online. The cool thing about this is that you can include your personal touch with laser engraving. There are wide varieties of authentically designed and crafted champagne sabers made from the finest manufacturers. Most avid champagne lovers collect these majestic pieces of art which can be very fulfilling. How to Saber Champagne at Your Wedding Reception? All your friends, relatives, co-workers and visitors are all excited for your big day. Of course, the host and the hostess are not the only ones who are overwhelmed and nervous about the event. You are also nervous and you want all the necessary things to be done accordingly and perfectly. Yet, of course, there is no such thing as a perfect wedding. But, there is a perfect bride and a perfect groom. In the reception, you want everyone to be still excited just like the same on the aisle.Not all really want to have a very decent reception. In fact, most people would love to jump up and go crazy and party around in this kind of occasion. Oh, the way, you can start the party as soon as you do the honor of sabering the champagne. Why Sabering A Bottle Of Champagne For The Wedding? Sabering is one of the most exciting parts of any occasion whether it is just a simple party, a wedding, anniversary or a job promotion perhaps. It does not only does the symbol of triumph making the occasion special, but it is the grandiose way of impressing the audience and at the same time, it signifies telling everyone to have a good time. The practice can be traced not so long ago, but it is somewhat connected to the history. Originally, sabering or sabrage is not performed as an art, but the soldiers back then are just becoming resourceful when it comes to opening a bottle of champagne. Since, bringing a champagne cork is not necessary during battle, the only way they can uncork the champagne is by using their weapons which is the saber. As years go by, it became popular not just in the European region but in all parts of the world. The art of sabrage is not just about the saber but the technique. It is not how sharp the edge of the blade, but how do you execute the pressure pushing the lip of the bottle and letting it glide as the bubbles flow. In fact, champagne sabers these days are blunt, meaning, there are no sharp edges at all. Yet, the authenticity of the design and how it is crafted are truly magnificent. You can perform champagne sabering at any point of the reception. Whether you like it at the start, in the middle of the event as the highlight, or probably at the end. Indeed, it is a very entertaining event that anyone and everyone can enjoy. You as the groom has the privilege to do so. Or you can allow your best man to do the honor. Make sure you both practice at home by the way. Of course, you don’t want to spoil a good wine back at home during the practice. The good thing is, you can try sparkling wine just make sure to chill the bottle properly. Also, make sure to use a champagne saber or champagne sword only and not your usual kitchen knife. If it seems complicated both of your schedules, you can request the chef or the crew to perform this art. You can do this before you do the toss or a simple speech. This can add a little bit of excitement and twist to the event. Celebrating an occasion will never be the same without pouring champagne to each and everyone’s flute. In fact, regardless of the occasion, champagne is the highlight of the event. It is the world's finest beverages as they always say. However, if such great wine does not pour or served properly, it loses its distinctive taste. So, what are the best way to preserve its taste? Let’s find out below. The best way to serve champagne and to drink it is when it is cold. Yet, keep in mind that there is a big difference between cold and ice cold. Some people in a hurry would like to put champagne in the freezer in order to fasten its cold temperature. This is terribly wrong which may destroy the taste as soon it was served. It is better to wait than never. It is highly recommended to place the bottle in the fridge or better yet, submerge the bottle inside the bucket wine with plenty of ice. While waiting for your champagne to chill, you should prepare the flutes. Experts say that using a tulip glass is better. Prepare the flutes by cleaning them tea towel or linen napkin. This will remove dust and watery mark. In this case, milk would be your worst nightmare. Therefore, when washing the flutes, make sure that they are not included from milky substances. After an hour or so, it is time for you to prepare the bottle of champagne. First, is to get the tea towel and polish the bottle. When opening the bottle of champagne, first, is to remove the foil then the ware cage around the foil. It is wise to keep your thumb on the cork to support it while removing the wire. There are two ways on how to open the bottle. One is by gently twisting the cork from the bottle. After a few pull of the cork, you’ll see the cork will pop up. Keep in mind to place the bottle where no one will get hurt. Secondly, is by removing the lip of the bottle together with the cork with the use of a champagne saber. Sabrage or sabering is a classical and extravagant process when popping up the cork. This is done by professionals and the only way to do so is by using the right tool like a champagne sword or champagne saber. There are techniques behind this art, but it is not as complicated as it looks. All in all, you can perfectly execute this technique through practice. The crown may be astonished when executing sabering or sabrage. But the highlight reel is not the technique but the drinking. When pouring a glass of champagne, make sure to ask someone to hold the glass for you in a few seconds. It is wise to pour the bottle with two hands, one is holding the bottom of the bottle and the second one is supporting the weight from the neck. It is graduation day, and you are thinking of something unique you can give to your son. You probably think about a sports car, yet, you have a long way to go. Keep in mind that what really matters is the thought rather than the thing you are about to give. All in all, you can never go wrong that has a personal touch which can be a reminder of what he accomplished and you are proud of it. It is like passing the baton to your child which eventually becomes a man. Reaching his dreams would not be possible without your efforts and of course your encouragement towards with his dreams. He truly deserves this kind of stuff which can be displayed to his apartment or condo unit when he starts working to the big city. This could be a reminder that he can always go home not just in time of need, but also in the time of triumph and occasion. During the holiday season, for example, he might be thought to celebrate the occasion to someone else, yet, when seeing this hanging somewhere to his bedroom, it will be a reminder to always come back home. You may think that this is just a mimic of sabers back then during the era of Napoleon. Yes, it is true but there is more than that when it comes to the history. Champagne sabering or sabrage has a long history which connects to this event. Those days after the French Revolution, Napoleon was known for his cunning strategies winning wars after wars and battles during his era. Little you did not know, they also carry champagne and wines with them. The problem is, no one ever thinks to bring a champagne cork with them to unbottle the wines. Lucky, his men are very resourceful and this is where champagne sabering was born. The art made famous when they visited aristocrats and let his men do this trick. Where Can I Find Champagne Sabers? You can easily do so by taking the advantage of the web. In here, there are many majestic sabers that can choose from. You don’t have to worry about a thing since these blades are actually blunt. Why did you ask? It is because the art does not need sharp edges to make the lip and the cork fly away.Learning sabrage can be exciting which will be your chance to have a time of your life with your child becoming a man. Basically, there are two types of champagnes you can buy at your favorite liquor store both offline and online. One is the non-vintage champagne which is less expensive and the other one is the vintage champagne. Obviously, it is pricey compared with the non-vintage type of champagne. So why it is more expensive? - The reason behind this is because of the process and the grapes which are only harvested once a year in a certain season. While non-vintage are the grapes which are harvested anytime of the year. The vintage ones must be kept in cellars for about three years or so before the sedimentation process. Premium vintage champagne is ideal for birthdays and special occasion as present. Besides, who can resist a sweet drink such as this? The recipient will certainly appreciate the present that he or she will cherish. It is a perfect gift and a perfect drink for celebrating important milestone. This can be a perfect way to say thank you for your previous clients for entrepreneurs like you. Don’t be surprised when they call you or inquire another project though. It is like hitting two birds in one stone. You can also gift your loyal subordinates especially when they did a very good job when it comes to work. This little gratitude can be so much to them. What a perfect way to ask for wedding proposal. You may use an element of surprise when popping up the question. The technique is a little bit old but it still works these days. You can put the ring inside the champagne flute before the good wine is poured, or you can ask the waiter of presenting the engagement ring as soon as the vintage champagne will be served. You can also try the things you have in mind. The Holiday season is meant for families. You can gift your relatives and friends with this amazing champagne. Of course, you have to keep two or at least three for you and your family to celebrate with. You can wrap the champagnes to add a bit of excitement. They may presume that it is a kind of liquor, but wait until you unwrap the gift. It is certain that this gift would be one of the best gift they ever received during the season. Champagne is indeed always present in any types of celebration, but what is a wedding without a vintage champagne? It is actually the highlight reel of the occasion next to the kissing part. All in all, it is also ideal for gift for the couple as you wish them all the best. During anniversaries, instead of going to fancy restaurants, a practical way of celebrating the occasion would be dinner at home with a bottle of vintage champagne. Anniversaries can be celebrated in the simplest form of celebration and it does not have to be sophisticated. You might found some articles that indicates that you don’t need a champagne saber or a champagne sword to execute the art of sabering. Quite frankly, the secret of success of cutting the lip of the bottle smoothly is not based on the force you are going to use when sliding the blade. Instead, the trick here is pretty much simple and that is what is really happening from the inside of the bottle. Yet again, would you prefer to screw using a knife rather than a screw driver? Of course, it is easy and less risky of using the right kind of tool. The same principle goes when it comes to sabering, you can use a typical knife but be very careful to do so, or, you can use a champagne sword which is specially designed to do the trick. There are wide varieties of choices when checking these awesome pieces of stuff online. Whether, you are out of budget or not, you can always find the kind of saber that suits you. Yet again, you have to keep in mind that not all of them are created equal and there are some sabers or swords you can find both offline or online which are poor in quality. The good news is, there are champagne swords and sabers which are budget friendly and have the authenticity when it comes to the overall design, materials and crafting. You want a champagne saber or sword that are going to help you to get the sabering done nice and smoothly. Moreover, you want a saber that can leave the audiences stand and owe about its magnificent beauty. It should be durable, balanced and at the same time, it should not be stressful. Investing with well-made champagne sword or saber is the right thing to do. This will prevent you from accidents that can happen during the performance and you will be not anxious every time you saber a champagne because you know that the tool you are holding is safe. This is because, champagne swords and sabers are intended to cut the lip of the bottle. Using the right amount of force and technique does not guarantee perfection and safety when using your kitchen knife. Therefore, for greenhorns, chefs, professionals or for someone like you who wants to learn this technique, it is highly preferred to use champagne saber or sword. 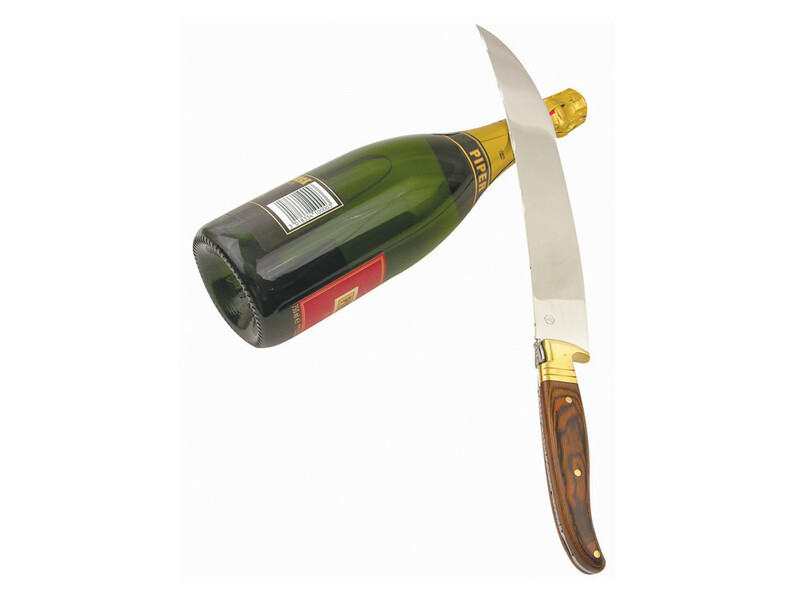 So, you’ve seen some of the most sophisticated champagne saber with sophisticated prices. The Viper Methuselah Damascus Steel Saber for example, is a limited edition of saber that can put Thor’s hammer into shame. It is indeed a very pricey kind of blade because of its rarity, but most of champagne enthusiast and collectors would want this badly. All in all, the blade does not necessarily mean that it is only exclusively intended for those people who are eating caviar from their limo. But there are those that are budget friendly such as the Laguiole La Roque, Fox Sciabola del Sommelier, Fox Due Cigni Sabre Bullae and Berkel Corsaro Wenge. Unlike the typical wines whether it is a white or red one, champagne is a bit different from these types of wines. Yet, champagne is considered as the premium wine. Keep in mind that there are big difference between a champagne and the so called bubbly wine. So, why such premium wine got bubbles? Just like your sodas and beers, champagne has a lot of bubbles to produce especially when pouring. Bubble is not a secret when it comes to science. It has a simple explanation that everyone and anyone can simply appreciate this fact. When you pop up a champagne cork, the chemicals from the inside including the yeasts ferment sugars and carbon dioxide reacts. And yes, your sodas and beers has carbon dioxide gas as well and this is why you see a lot of bubbles. The carbon dioxide gas in other term is called the spirit inside the glass which is even today, many would use such term which is somehow a little bit scary but funny. These tiny bids of rising gives the good wine sparkle above the surface of the beverage. The concentration of the carbon dioxide decreases in the champagne once it was exposed to the air. The distance of the bubbles can suddenly change overtime, and this is why you may observe that the numbers of bubbles has a different rates each time you sip the champagne flute. Approximately, there are about over than 9.8 Millions of bubbles in each champagne flute as you serve. The bubbles will of course vary depending on the carbon dioxide preserved inside the bottle. There are about over than 69 Millions of bubble per millilitre according to the Beekmanwine and from there, bubbles can range from 49 million of bubbles in a 750 millilitre bottle. So How Many Are They Really? There was a project between 1986 – 1989 where camera based computer linked with artificial version system to record the bubble’s releases. It was approximately recorded that there were about over than 50 million bubbles. As the technology continue to arise and the HD was developing, in the year 2001 the numbers of bubbles were calculated again and this time it is more accurate that has about over than 56 million bubbles. Not all bubbles are created equal in sizes, some will pop up immediately while others would stay longer than a minute or even longer. This affect the length of time when counting the numbers of bubbles. But the temperature has an effect when it comes to the number of bubbles that are producing. The cooler the cellar would be, the smaller the bubbles but the greater in numbers. Chilled champagne is essential to preserve the quality and taste. Now that you finally understand how sabrage (champagne sabering) works, it is time for you to learn on how to choose the perfect champagne saber or champagne sword that fits according to your budget. Keep in mind that when you found the cheapest saber online or offline, it does not necessarily mean that this kind of saber is your best option. Always remember not to compromise the quality over the price. Buying online would be the best option for you. This avoids you to get into the traffic jam, consume a lot of hours just to find a champagne shop near in your area, and best of all, you can transact or buy the stuff you like instantly. Yet, not all online stores that are offering champagne sabers and champagne swords are created equal. On your part, you should know by now on how to assess credible a credible site. There are online stores which after your hard-earned money rather than providing what you need. In many cases, what these fraud platforms would copy and paste the images from the legit champagne sabers and swords online stores and post these images to their own platforms. As soon as the item is delivered at front of your doorstep, regrets will follow when you opened the package. When transacting online, make sure that is has a money back guarantee policy in case that you are not satisfied with the quality. As a wise online consumer, take the time you need to know more about the online store which you are about to engage or transact. Read the customers’ feedback and reviews about the items and the service they provide. In case that you are in the US, check the online store from the BBB or Better Business Bureau. This site will help you about the complains or positive feedbacks about the site. When transacting online or there is a chance that your privacy can be at risk when buying champagne saber or champagne sword online, it is highly suggested to check the URL of the site. Instead of HTTP, a trusted site supposed to be HTTPS. The URL address can guarantee that your privacy is safe together with your other important information particularly your bank account number. Quality champagne sabers/swords were crafted and manufactured by the best in the business. Look for online stores that gives you the information where their products were created. This gives you the idea that you are at the right online store. Investing with authentic champagne sabers is the right thing to do. The good news is, you don’t need to buy the most expensive champagne sword available from the web today. In fact, there are authentic champagne swords and sabers made from the finest manufacturers in the world with reasonable prices. Moreover, you will not just get the saber itself, but also engraving, champagne saber stand, case and other freebies.